It is time for the Australian public to stand up to the criminal conduct by banks in Australia because they have a huge influence on our individual future with their control on superannuation funds. Thousands of Australians have already found that out with their retirement funds stolen by corrupt bank employees and then having to spend years trying to get it back. I have already taken a step in the right direction as the video and photo below show. The Labor Party’s pledge for a Royal Commission into widespread systemic corruption in the banking industry is long overdue but will not solve all the problems and the problems it does solve will be years away. Even so we need a Royal Commission as it will help put the spotlight on the corrupt banks at least for a couple of years. Of course if Labor don’t win the next election we won’t have a Royal Commission anyhow. But the Australian Public shouldn’t be sitting back totally relying on the government of the day to solve the problem. In recent times almost every bank has been knowingly involved in massive fraud either directly or indirectly stealing customer’s savings, so there is a lot of work to do for a Royal Commission. The banks are not scared of the politicians because they have them in their hip pocket through all the bribes or some call it donations, they’re not scared of the law and they are not scared of bad media coverage. But there is one thing that does scare all large companies that’s “Grassroots Social Media Campaigns” because they know they cannot control it and it can spread like a bushfire. I have been spent the last couple of days trying to get the ball rolling as the below video shows. It’s possible to take on anyone and everyone but there needs to be support. There also needs to be focus so I think the grassroots campaign should target one bank at a time starting with the Commonwealth. Hopefully the other banks will see what is happening and change their corrupt ways without a need for a campaign against them. And with the federal election not far away it is one of the best times to drive issues. The above video was organised in a short time frame with a limited budget but still cost just over $350 for the posters and two paint canvasses to put the posters on. While the above video is a fair and reasonable effort and will anger the CBA management, if there was more time and a bigger budget the video could have been a lot better. For example, there could be more posters or large banners or banners on the back of a ute parked outside bank branches etc. I know the video could have been a lot better if I had more time and resources as people were having a good read, a few people took photos and a couple congratulated me even though I was only at each spot for no more than 5 minutes. The bottom line is there are a lot of things that can be done but it needs funding. The banks generally win because they have more funding. That is why it is important to support the crowdfunding campaign this website is running. If the funds are raised, then this site can take the fight to the banks a lot better and they can be beaten. The crowdfunding campaign started well and has raised $3,531 of the targeted $80,000. But it has slowed a lot the last week or so. It is not an all or nothing campaign where you have to raise the full amount or you get nothing. All money donated comes into my bank account a few days after the donation. That is what helped fund the above video. I finished a 6-month temp role at the end of March and have been waiting to see how the crowdfunding campaign goes before deciding if I need to get another job or can work full-time on this website. I still have a few weeks to focus on this site before making a decision. But I would much rather be working full-time on KCA. If we can raise enough I would like to do another video like the one above. But this time bigger and better. 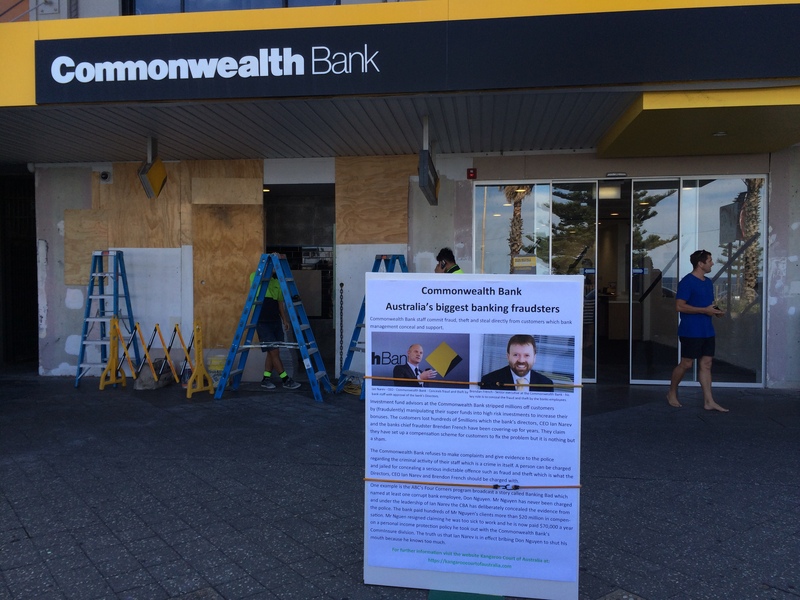 I remember when the Commonwealth Bank was the Bank for the people, there were no such frauds perpetuated then. However, with successive Governments the push for privatization won out, and the greedy hucksters who were the pressure front for the privatization in the first place got their hands on the banks and proceeded to rip off all Australians. The point is, the folks responsabile for the sell off of state owned assets, were none other than the folks charged with looking after Australians, which in this case, they did not do, and therefore, IMHO, should be held accountable. I’d dearly love to know, how many of our politicians, their families and friends/associates who have shares with these banks. We know who pushed for the Commonwealth to be privatised, and the Aussie dollar to be floated, an ex Bleating prime minister. Commonwealth Bank,The People’s Bank For All Australians. I had all my accounts and mortgage in that bank, but no-one asked me or the Australian people for permission to privatise the institution. As years went by, bank officials and whatever a C.E.O does, which used to be a managing directors position, have turned the whole institution’s management team into blatant liars, cheats and crooks, far more crooked than the masked blokes who used to rob our bank a few times a year at gunpoint. There is no need for a gun in today’s banks, bank officers bend and twist the figures to steal directly from customers’ while telling people to, “Have A Nice Day”. FYI There’s a Change.org Petition specifically on ComBank with close to 50,000 signatures. Maybe you don’t know? Might want to connect with the Petitioner? She lost her Home. As best as I can understand how a once well regulated Banking system can now flout the regulators is through the medium of vastly reduced operating budgets and reduction in employees has made the regulatory task impossible. In days of yore the Prudential Regulator issued dictums to the Banks that they had to follow or face some sort of panel to be seated in front of the days of yore Prudential Regulator would ask questions as to, “what do you senior Bank executive people think your up to, heads will roll over this non-regulatory abidance. Now enter the newly formed Banking Corporation model, replete with its huge salaried directors, who have began to challenge every accusation brought against them, the higher the amount of monies involved, then the higher the court jurisdiction and the commensurate costs. For example the matter of the allegations goes to the hugely expensive High Court (along with the Bank’s coach load of QC’s) the argument begins, however the crafty QC’s manage to derail some componentry usually a small number of legal trifles, then the case is postponed for a short period. Whereby soon thereafter a discussion evolves between these high ranking members of society as to who might be the beneficiary of some form of gratuity for their excellent decision making skills. Bearing in mind that Bank’s are not skimpy when it comes down to rewarding the most deserved of persons. A case in point, the NAB lost a High Court case via their non-attendance to their Codes of Conduct. Just recently the CBA were given favour via a separate High Court case to not be held liable to their Codes of Conduct. Ask yourself the question who is it that approves the elevation of Court-house judges to a higher ranking distinction. Somewhere within the answer is the political influences that are brought to bear upon those that do the promoting. Every soul on Earth has his price but some are vastly more expensive than others. An insider recently advised me that there is one object above all else that has its singular over-ruling influences everywhere, MONEY. put in place Glass-Steagall Legislation now before the Banksters cry for Bail-In of Australians Deposits & Superannuation. Bail-in is legal in NZ, UK, EU & USA. Just a thought Shane but did you have the large poster available as a hand out so all that stopped to read it could pass it on amongst their friends? Or maybe a precis version with website information on it? No I didn’t. but there are a lot of other things that can be done. I do not think handouts are needed as people can take photos which a few did. It was a bit of a test run. COMSEC now jumping into bed with Goldman Sachs, Malcolm’s former (and likely current) bosses. We are becoming occupied territory.